I hear the heat is getting unbearable back home. Then there's no better way to cool off than a trip to the beach, or the backyard pool at least, haha! And with summer comes a lot of great stuff, the perfect reason to shop. 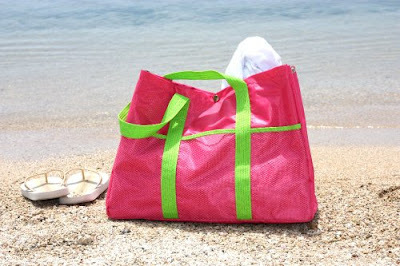 So indulge your urges and add a beach bag to your shopping list - it is a necessity after all. Plus, when it'll only set you back Php695, such as this on from FILED!, hey bring it on. 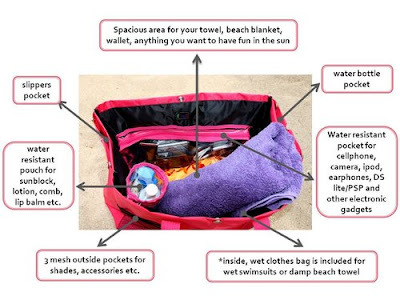 What's nice about this bag, apart from the really reasonable price, is that it has water-resistant pockets for your gadgets, a detachable toiletries pouch, a wet clothes bag, and pockets for flip flops. Talk about being organized, even on a carefree summer day! For more on FILED! products and the young entrepreneurs behind the label, check out their Multiply site!